I'm by no means a scrum expert, nor even the user, but doesn't scrum rules say that you have to deliver fully tested "potential releases" in the end of every sprint? Also, you shouldn't mark stories as compleate if they still have bugs, and do not deliver the intended value. 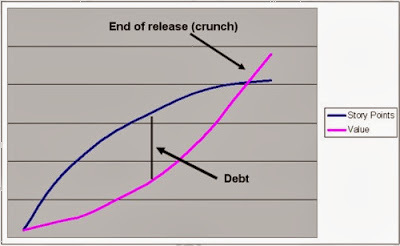 This way you will avoid getting in debt with product's value. You're right, but the bugs that we see in game development aren't the traditional bugs that are simple binary ones that can easily be identified. Many are of a qualitiative or subjective nature. It gets back to what is "fun" as well. I reworded it slightly to reflect that these were "tuning and polish" issues rather than bugs. We call them all bugs but I realize this convention isn't shared. Thanks. Yeah, i've been thinking about polishing part and how it would integrate with game development using scrum a lot. I think there are two ways of handling it. First, as i've already mentioned, is to leave the story as unfinished if it's not compleate (polished enough) yet. Since teams are crossfunctional, game designers in a team could have a final word on such stories, where word "finished" is a bit vague and involves "fun" factor. Or lead artist could have a final word if assets are of required quality, etc. Secondly, since scrum proccess is iterative and designed for fast feedback, you can use that feedback at the end of the sprint to add new stories into product backlog for polishing the existing features. If they have enough value, they could be pulled in the successive sprints. This is where "by-the-book" breaks down. The first solution doesn't work with cross-functional teams as well as you might think. The second solution doesn't address the problem of carrying debt. It's close to what we do now. The current solution is to have discipline leads on each team that show versions of the game to the customers twice a week and get feedback. This is very command-and-control "by-the-book". The question to me is how to build this feedback cycle into a self-organizing team without impacting commitment. Agreed. 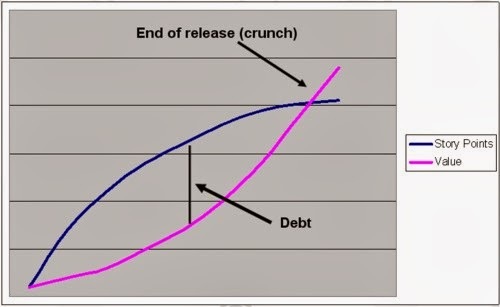 I think we can get a pretty steady "story-point per release" measure that should stay near constant (or steadily improve) on a release to release basis, but not per sprint. There's been some good discussion over in the yahoo scrumdevelopment list along similar lines. Mike Cohn makes some good points about not relying too much on "story points per sprint". Stories that are small can be far more accurately estimated than the larger stories. Plus it seems the inaccuracy is on the underestimation side. This is an interesting and thought-provoking article. I wonder if some (or much?) of the debt due to team members claiming that a bit of the product is done when it really isn't done-done integrated including tool path? E.g. sure, the code is technically complete, but there doesn't exist any means by which the functionality can be exploited except in very limited (and perhaps hard-coded or on the developer's machine only) ways? My experience with Scrum is across a wide variety of environments and teams, and one of the things that as a manager I've been mindful to ask the person as a task was being moved to the completed column, "ok, so how does a content creator see that in the game right now?" Do you have to deal with this issue at High Moon, now that you've been doing Agile Things for some time?